Adventure Awaits! is the creative production of artist Jess LeClair. 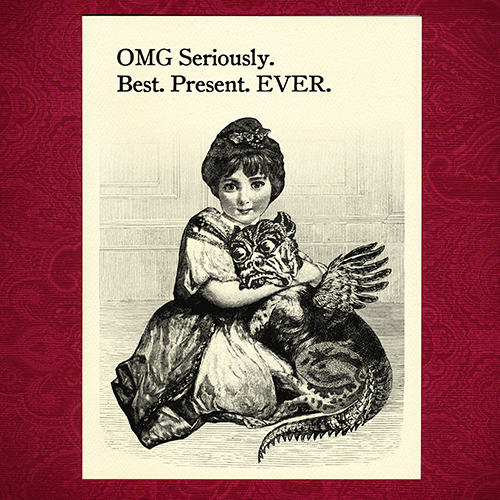 Her greeting cards feature recombined Victorian era illustrations paired with some modern wit. There is a little something for every occasion, even those hard to define moments. She also offers pinback buttons featuring vintage illustrations, magical protection and a bit of snark. Adventure Awaits is based out of Bangor, Maine. You know the feeling. The one where you get the thing you have absolutely always wanted and you are SO EXCITED ABOUT IT. Make sure you let the person who got it for you know how much you appreciate the gift! Seriously, these make the best thank you cards EVER. 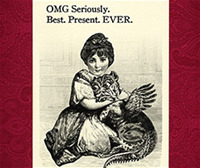 Card reads: "OMG Seriously. Best. Present. EVER." It is blank on the inside. The image is printed on warm cream colored 80 lb card stock with a felt finish. The card is 5x7 and comes with its own matching textured envelope. Each card will come in its own clear cellophane envelope.